Chris Day already knows “big data” is a big deal. The next step is researching how to use those figures to make roadway systems safer and more efficient. That’s in part what brought Day to the Institute for Transportation (InTrans) this past fall, after seven years as a senior research scientist at Purdue University’s Joint Transportation Research Program. Day said InTrans appealed to him as one of the strongest transportation research programs in the nation that has a good working relationship with other transportation agencies and a good potential for growth. Plus, it will allow him to continue work on what he knows best: performance measurement and related applications of data. “Although agencies are beginning to pick up the technology, the next step is to figure out how to best use it, and integrate it into business practices,” Day said. 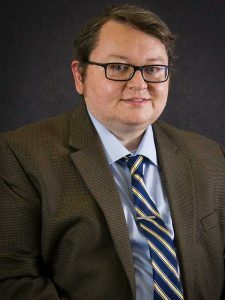 Day, who also works as an assistant professor at Iowa State University, has focused his research on mobility performance measures that help use data to assess roadway conditions and traffic signal systems performance measures that he hopes will help traffic engineers better manage their systems. Day is currently assisting on the Iowa Department of Transportation’s annual mobility report, which uses probe vehicle data collected by a private-sector company through various mobile applications. The report focuses on Iowa interstates and uses that probe data to assess congested hours and reliability of travel, with the goal to develop visualization tools to monitor traffic. Performance measures like those Day works on have the potential to yield insights into the reasons for delay. “That potential has yet to be fully realized,” Day said. He said he also hopes to work on technological advances in transportation in the future. Particularly, Day wants to conduct research on connected vehicles and other sources of vehicle location data. “There is a lot of potential for that type of data, and ultimately eventually closing the loop and using that data to improve the system performance,” Day said.